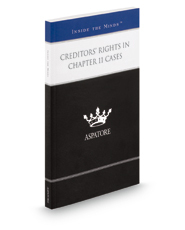 Creditors' Rights in Chapter 11 Cases provides an authoritative perspective on best practices for advising secured and unsecured creditors during insolvency proceedings. For even the most seasoned practitioner, effectively navigating the Bankruptcy Code and Rules has long presented special challenges. Today, with the stakes so high, the balance of power between debtor and creditor requires greater know-how than ever before. With this title, you have the advantage once again. Inside this book you'll discover practice tips and strategies from partners from some of the nation's leading law firms.